WAIST HIGH: Happy 25th Birthday Introducing The Style Council. 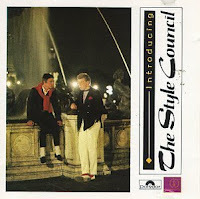 Happy 25th Birthday Introducing The Style Council. Waist High favorite Introducing The Style Council was recorded in Paris in the summer of 1983. The album was initially released only in the United States, Holland, and Japan, and was heavily imported to the UK. "It is a compilation of tracks from the band's first three UK single releases. The band's official debut album, Cafe Bleu, was released the following year. The 'Club Mixes' are exclusive to this release." The EP features the greats "Long Hot Summer," "Speak Like a Child," "The Paris Match," and "Money-Go-Round," called "a fine British-funk manifesto" by John Floyd of allmusic.com. The Style Council was formed "in 1983 by ex-The Jam singer and guitarist Paul Weller with keyboardist Mick Talbot. The permanent lineup grew to include drummer Steve White and Weller's then-wife, vocalist Dee C. Lee. Other artists such as Tracie Young and Tracey Thorn also collaborated with the group."